A spicy aromatic ready-to-cook curry sauce for meat with coconut milk, chilli, coriander and spices. Just add water and meat. No Preservatives. No Colouring. Gluten Free. Once opened, keep refrigerated. Use within 24 hours. Ingredients: Onion, Coconut Milk (24%), Water, Palm Oil, Spices (Coriander, Ginger, Turmeric, Cumin, Fennel, Curry Leaf, Star Anise, Cinnamon, Black Pepper, Clove, Cardamom) (6%), Salt, Chilli (3%), Sugar, Garlic, Modified Tapioca Starch. 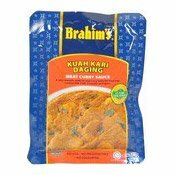 Simply enter your details below and we will send you an e-mail when “Meat Curry Sauce (Kuah Kari Daging) (咖喱肉醬)” is back in stock!